Planet Earth Autos products use the CDE Software Systems Finance Calculator Engine and can be embedded in websites and Windows apps. This version is in an automobile loan finance calculator format to help you estimate your monthly loan payments and finance charges. Recalculate your automobile loan with different interest rates and finance terms using our simple finance calculator form. After the calculation is preformed, one click gives you a complete amortization schedule. Use Planet Earth Autos automobile loan finance calculator to help you estimate your monthly loan payments and finance charges. Recalculate your automobile loan with different interest rates and finance terms using our simple finance calculator form. 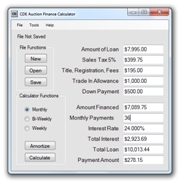 After the calculation is preformed, one click gives you a complete amortization schedule. Amount of the automobile purchase before taxes and fees. If you are required to pay sales tax on your vehicle purchase enter the sales tax rate. Leave black or enter zero to not calculate sales tax. Tax is calculated against the vehicle price only. Some states allow a deduction for your trade in against the taxable amount causing your payments to be slightly lower. Check with your state to see if this applies. These are usually small fees for documentation, title and/or transfer fees. This is how much will be deducted from the purchase price for your vehicle trade in. Planet Earth Autos Corp. Automobile Loan Finance Calculator is made available to you as a self help tool for your independent use and is not intended to provide financing advice. We can not and do not guarantee their applicability or accuracy in regards to your individual circumstances. All examples are hypothetical and are for illustrative purposes. We encourage you to seek personalized advice from qualified professionals regarding all personal finance issues.